Los Angeles, CA — On the first of the year, California residents were officially told by the government that they could now buy and sell cannabis without fear of being kidnapped, caged, or killed for it. Legalizing weed also meant that there would be a host of questions about how exactly the system will work and the rules people need to follow—up to and including how airports would handle it when people try to fly with it. One city in California set out from the bat to establish their rules for citizens wishing to possess the plant at their airport and LAX said they are just fine with it. 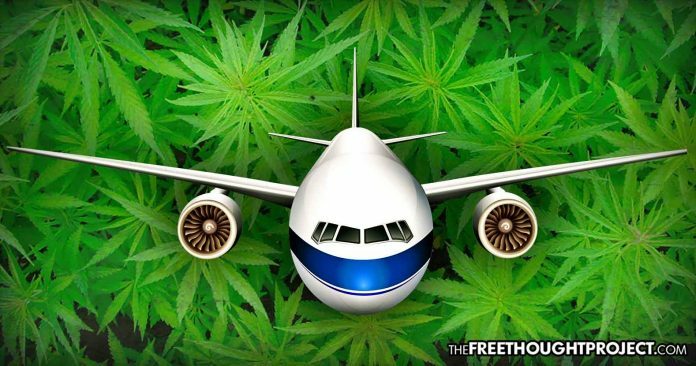 According to the LAX Marijuana Policy listed on the airport’s website, citizens are allowed to try to fly with weed. Naturally, the TSA is not too happy about this move and is speaking out to remind citizens that having this highly beneficial plant is still a crime. Because TSA is a federal agency and enforces federal laws, if they find you trying to fly with a little weed, they will call the cops. TSA spokeswoman Lorie Dankers said Thursday that agents won’t take it away but will summon the police and let them deal with it, according to FOX10. “Whether or not the passenger is allowed to travel with marijuana is up to law enforcement’s discretion,” she said. So what happens when TSA rats out your stash to the fuzz when you try to fly? Well, if you are carrying no more than 28.5 grams (about an ounce), or 8 grams in concentrated form, airport police won’t do anything. Being that airline passengers only go through security at their departure airport, this opens up the possibility of interstate transportation and sale of weed—albeit, only one ounce at a time. This move by LAX is unprecedented in states with legal weed. In Colorado, one of the first states to legalize recreational marijuana in 2012, it is still illegal to bring it into Denver International Airport, much less fly with it. However, because it is legal in the state, the police usually just make the travelers throw it out before boarding their flights. “If it’s a small amount the TSA and the Denver Police Department will ask that person to dispose of it and if that person is willing to do that they move through,” Denver Airport spokeswoman Emily Williams said. What this illustrates is the growing acceptance of marijuana by those who used to kidnap and cage people over the plant. Sadly, however, as TFTP reported this week, there is still a long way to go as statistics show that arrests for weed are increasing—in spite of legalization.